ore often than not our busy work schedule requires power and mobility at one place. Because DigitalMagnet is always eager to show you the best solutions in every class, here is something interesting – this is one highly portable ultrabook. The Acer Aspire S3. This is one exceptionally portable ultrabook thanks to the fine design and the light weight of only 1.4kg. The aluminum case features slim and elegant lines that make the machine only 17.5mm thick. It will easily fit in your paper bag and you will barely recognize it in the pile the books and magazines. The screen is offers 1366×768 pixel resolution. The graphic processor on board is Intel HD graphics 4000 and provides great visual experience brought to you by the 13.3’’ HD CineCrystal LED LCD display. What we didn’t like about it, however, is the glossy surface since it makes you experience annoying reflections. 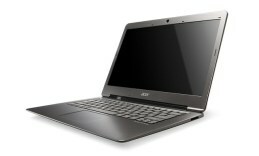 One member of the numerous S series Acer family this is aspire S3 391. The machine can be defined as an entry-level ultrabook, which automatically makes it more affordable. In comparison to most ultrabooks it is less powerful but doesn’t fall much behind their hardware potential. The processor is facilitated by 4GB of RAM – plenty of memory to deliver smooth performance. To reveal its potential let’s peek under the case of Aspire S3.The hardware filling features 2nd generation dual-core Intel Core i3 CPU, which is an entry-level low-voltage processor that handles most common applications like a piece of cake with its 1.4GHz working frequency. However, it will probably experience difficulties with professional software since the working processes are hosted by the older generation processor Sandy Bridge. The processor is facilitated by 4GB of RAM – plenty of memory to deliver smooth performance. The case provides comfortable control in the shape of an island-style keyboard with soft keys and a touchpad panel, the auxiliary keys are integrated into its surface. We found the speakers of the ultrabook placed on the bottom of the case. This Acer ultrabook provides plenty of storage having in mind that it is pretty slim and affordable too. On this ultrabook you are equipped with 500GB of hard drive storage. The webcam and the built-in microphone provide on-the-go communication. The 3-cell lithium-polymer battery ensures around 5 hours at moderate workload and moderate brightness. The connectivity abilities of this Acer ultrabook include Bluetooth 4.0, 2 USB v3.0, card reader and an HDMI port. The machine comes loaded with the new Microsoft Windows 8 Home Premium at 64 bits.